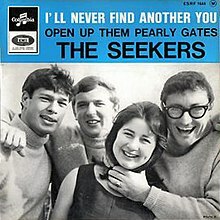 "Open Up Them Pearly Gates"
(1964) "What Have They Done to the Rain"
(1967) "I'll Never Find Another You"
(1967) "It's the Little Things"
"I'll Never Find Another You" is a 1964 single by The Seekers which reached No. 1 in the UK in February 1965. It was The Seekers' first UK-released single, and was the second-best selling single of 1965 in the UK. The song was also popular in the US, reaching peaks of No. 4 pop and No. 2 easy listening on the Billboard Hot 100 charts. The track was written and produced by Tom Springfield, who was also responsible for most of The Seekers' subsequent hits. The tune received a 1967 US revival as a country music No. 1 by Sonny James. In 2006, it received yet another revival with a folk rock cover from guitarist Les Fradkin on his CD Jangleholic. In July 2018, the song was featured in a Westpac bank TV advertisement in Australia, covered by Julia Jacklin. The song was added to the National Film and Sound Archive of Australia's Sounds of Australia registry in 2011. In 2010, the song was performed at a benefit for the homeless youth organization Teen Feed by Death Cab for Cutie frontman Ben Gibbard and his wife, singer/actress Zooey Deschanel. Filipino singer/actress Nora Aunor covered the song for her 1968 album Nora Aunor Sings. ^ a b c d e f Rice, Jo (1982). The Guinness Book of 500 Number One Hits (1st ed.). Enfield, Middlesex: Guinness Superlatives Ltd. p. 89. ISBN 0-85112-250-7. ^ Whitburn, Joel (2002). Top Adult Contemporary: 1961-2001. Record Research. p. 218. ^ Whitburn, Joel (2004). The Billboard Book Of Top 40 Country Hits: 1944-2006, Second edition. Record Research. p. 172. ^ "YouTube". Westpac Banking. 24 July 2018. Retrieved 3 August 2018. ^ "Sounds of Australia // National Film and Sound Archive, Australia". Nfsa.gov.au. Retrieved 5 April 2014. ^ "Billboard Magazine, March 13, 1965". Billboard. ^ Roberts, David (2006). British Hit Singles & Albums (19th ed.). London: Guinness World Records Limited. p. 175. ISBN 1-904994-10-5. ^ "Billboard Magazine, December 1982". Billboard. ^ "107.7 The End: Ben gibbard + Zooey Deschanel - I'll Never Find Another You". YouTube. 4 November 2010. Retrieved 5 April 2014. "When Will the Good Apples Fall"
"Love Is Kind, Love Is Wine"
This page was last edited on 22 November 2018, at 22:35 (UTC).